For a simple ratatouille, you’ll need onions, zucchini, eggplant, peppers, garlic and herbs. 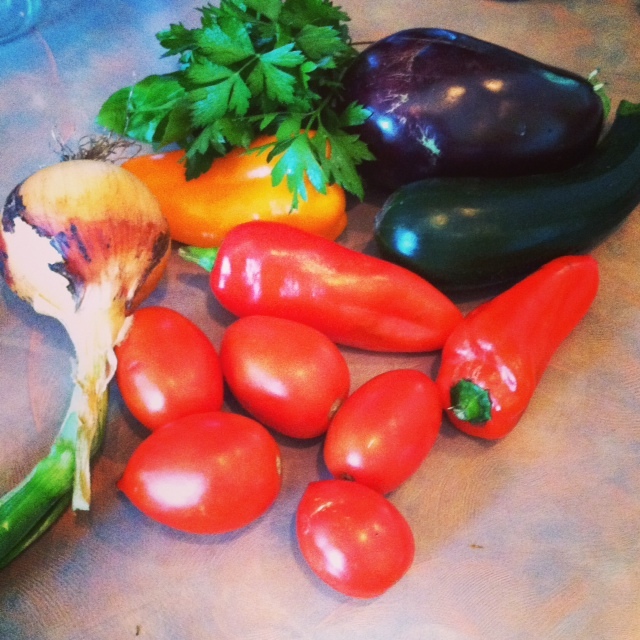 Ratatouille may be one of the most delicious late-summer garden recipes. Traditional ratatouille includes eggplant, zucchini, onions, peppers and tomatoes, but since the dish is essentially a vegetable stew, you could add green beans, yellow squash or anything else that is fresh and suits your fancy. A while ago, I paid a visit to Sam Kedum’s Nursery in nearby Hastings to buy some tomatoes for preserving. While I have had a decent crop of tomatoes this year, it has not been huge and most of the tomatoes I grew were slicers that have been quickly consumed in salads and on BLT sandwiches. At the nursery, which includes a community-supported agriculture farm, I also bought cherry tomatoes for drying (recipe to come next week) and some peppers, eggplant and zucchini, which looked firm and delicious. You can find lots of recipes for ratatouille on the web and mine is a modified version of Alice Waters’ take. Feel free to adjust vegetable and seasoning amounts to suit your own taste and veggie supply. Cut pieces about the same size. Add a bit more of the oil to the pan and add the onions. Season with a bit of salt and pepper and cook the onions for about 4-5 minutes, stirring often until they are translucent. Add the garlic and cook for another minute. Push the onion, garlic aside (but still in the pan) and add the a bit more oil to the pan and add the zucchini. Let it sit in one layer for about 3 minutes to get a bit of brown on it, then stir with the onions for another 2 minutes. Add the peppers and stir everything around together for about 3 minutes. Add more salt and pepper if you like and the 1/4 tsp of red pepper flakes. Push the veggies to the sides of the pan and in the space in the center, squirt about 2 tablespoons of tomato paste. Move that around with your spoon or spatula for about a minute to cook the paste a bit, then add the wine and the tomatoes. Stir the eggplant back into the mixture, and let it all cook together for about 10 minutes. 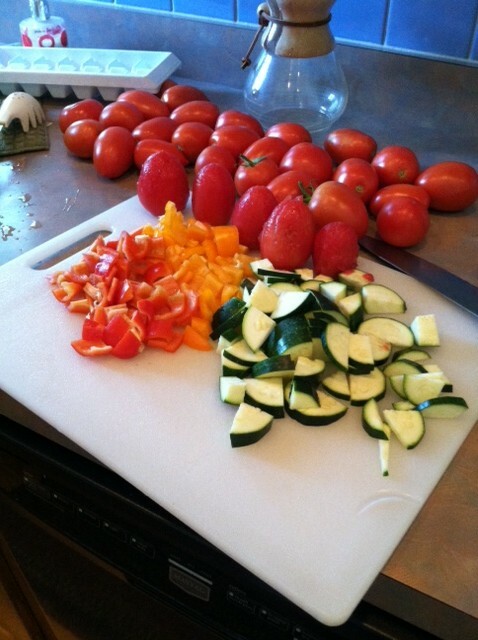 Ratatouille could be eaten as a main course with cheese on top or as a side dish to grilled chicken or fish. The flavor improves upon sitting, so leave it in the fridge a day or so for optimum deliciousness. I planned to take a photo of the finished product, but we ate it all before I had a chance. What’s your favorite way to eat your fall vegetables?